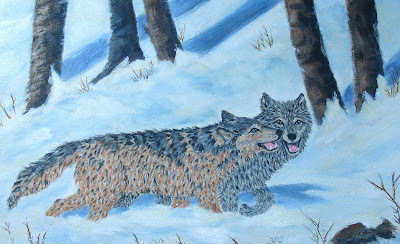 "On the Rocks", I think I was drinking something on the rocks when painting this. Going to the beach once the weather warms up a bit, just to study the water and rocks. Oh life is good! My cousin Sue, is a very talented artist. 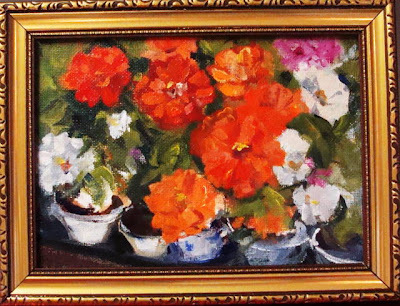 This is a painting she did 3yrs. ago. She will be starting her blog soon. Just wanted to introduce her to all of you kind people. 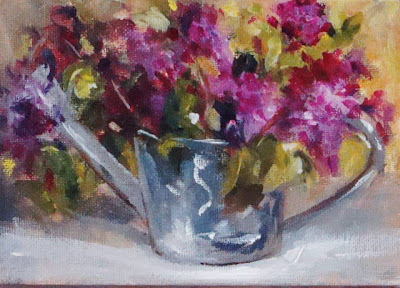 Just off the easel, still on the fence with this one. I'm calling it Two Flags. It's from a photo of a little beach in Patchogue. Yesterday, I actually painted outdoors. This is a tulip in my garden. 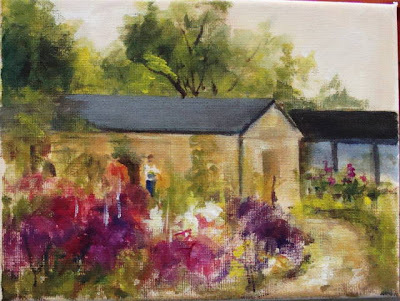 Wow, plein air painting is difficult. Colors look so differently while painting. Not to mention other distractions. Neighbors mowing and the loud sound of a leaf blower. But I have to say, I loved every minute of the plein air experience. Can't wait to go to other locations other than my own back yard. Happy Monday everyone. Long Island has been having glorious warm weather. So it's time to shift winter clothes for summer clothing. Boring, I much rather paint. This is just a quick once again gouache sketch, until I have more time. Practice, practice, practice. Using designers gouache, primary colors only. Yes, this is much better. Still have to practice. Wow so much to learn. Monday morning. 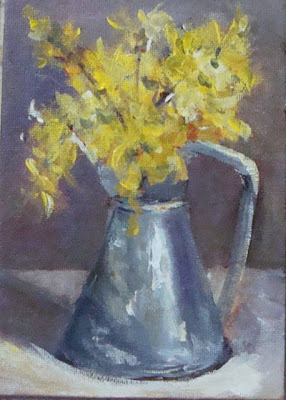 Decided to change the background and work on the forsythia's. Background could use more work. I do believe that time is needed just for painting. I have to stop thinking quantity for the sake of posting and get back to simply painting . So therefore I shall take a break from blogging, and try to post once a week or maybe once every 2wks. Happy painting to all my blogger friends. It is so helpful to see my work from a different perspective. Yes, tomorrow I have some corrections to make. 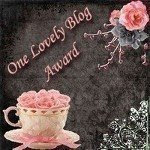 I have just received the One Lovely Blogger Award from Darlene Twitchell. A very talented artist, I am honored. Thank you Darlene. quick outdoor sketch, before the rain. Took pictures to do a better study. 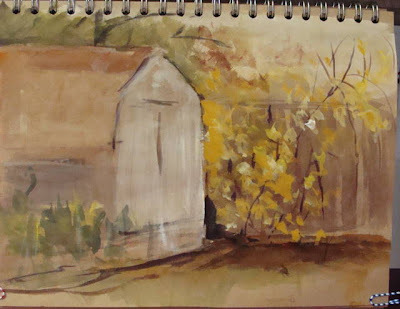 These are quick studies of farm and nursery studies. After having fun with these, I think it's time to settle down and do some serious painting. 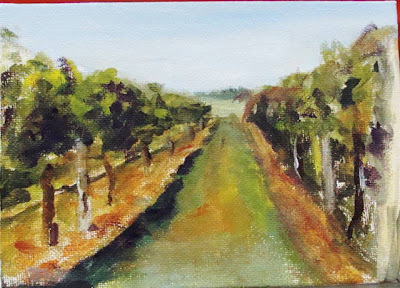 A sketch of the Palmer Vineyard. I think it's best to leave it alone for today. It's on the verge of being over-worked. 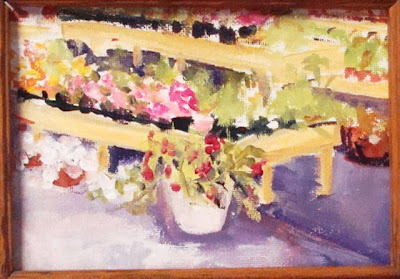 Just started working on this 6x8 of a farm stand. I'm trying to work in the 30min. to 1hr. time frame. It looked better 1/2 hr. ago. Oh well, little more tweaking. Liz is an extraordinary artist. Thank you Liz. The Lemonade Award given to bloggers who show gratitude and a positive attitude. I would like to share this award with the following artist with generous spirit. 4. List and link your nominees in your post and let them know they're recipients.